On September 7 while walking along the beach in Pachena Bay, a friend and I stumbled upon a moon jelly that had washed up on the sand. Jellies are drifters, meaning that while they can pulse their bodies to swim a bit, they are at the whim of currents and waves in the ocean. While most people immediately think of microscopic plants or animals when they think of plankton, any animal that drifts with the current is a plankter too. This includes jellies, salps, doliolids [PDF], and siphonophores. Whenever I spot a drifter, whether in the water while diving, from a boat or dock, or washed up on the beach, I report it to Jellywatch.org: a database of sightings that allows researchers to know where and how many drifters there are, with sightings from around the world. Check out the sightings around Bamfield, which include the moon jelly pictured above, ctenophores (also known as comb jellies), and a Chrysaora colorata jelly have been documented so far. 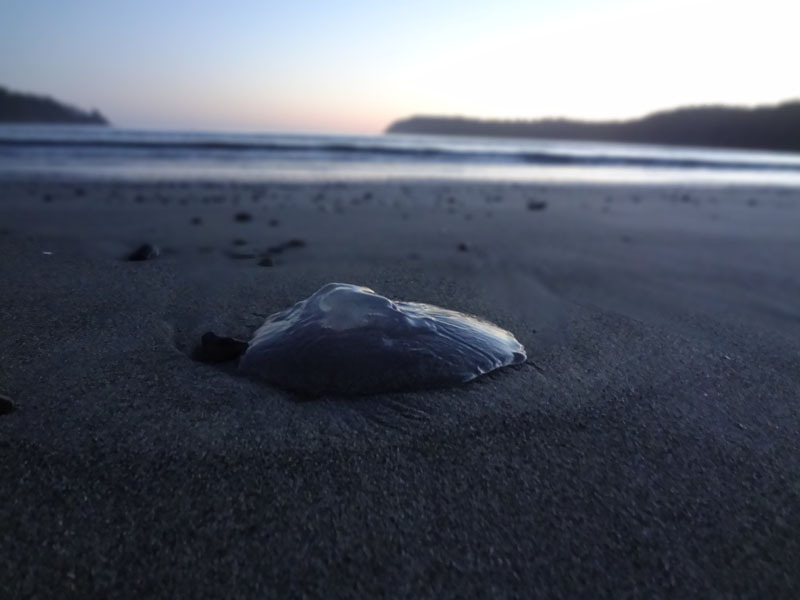 If you’re in Bamfield and see something, log it in the Jelly Watch website, and if you’re interested in drifters, check out the rest of the database to read entries of other cool sightings from around the world!